Yesterday was the Feast of the Assumption of Mary. Therefore, the Church traditionally celebrated a Vigil of the Assumption the day before. On this day, Catholics traditionally fast (and the East still maintains a fast prior to this feast) in preparation for the great feast of the following day. 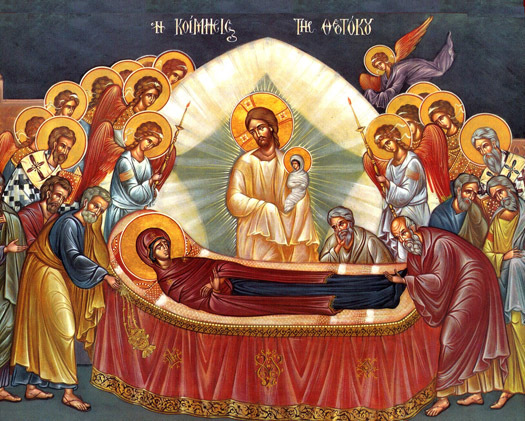 Therefore, on this day, it is good to recall the traditional doctrine of Our Lady's death (or Dormition) portrayed in the Eastern icon to the right. Ant. All the rich among the people shall entreat thy face; after her, shall virgins be brought to the King; her neighbors shall be brought to thee in gladness and rejoicing. V. My heart has uttered a good word; I speak my works to the King. Ant. Blessed art thou, O Virgin Mary, who didst bear the Creator of all things; thou didst bear Him who made thee, and thou remainest a virgin for eternity. Ant. Blessed is the womb of the Virgin Mary, who has borne the Son of the eternal Father.